Multiple problem behaviours can result from storm phobia. The most common include escaping/ hiding, vocalising and even inappropriate toileting & destructive behaviours can occur if your dog becomes really anxious. Your dog will be showing signs of fear; trembling, salivating, dilated pupils, racing heart rate. 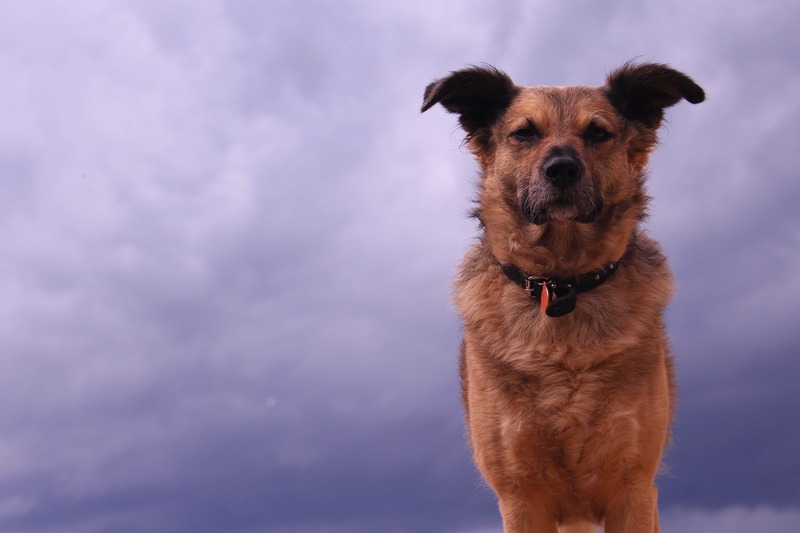 Dogs are sensitive and can be reacting to multiple different stimuli in a storm (not just the sound of thunder). They can sense approaching storms earlier than us and and can develop fear responses to the change of barometric pressure, gusty rain, wind/ leaves blowing, and lightning. Frightened pets try to escape and can injure themselves / get lost as a result. Dogs should have a collar, council tag, and most importantly a MICROCHIP with up to date contact details. Check your yard is secure. If you know a storm is expected try to be present but at least put your pet inside/ in a safe area where they are as protected as possible from the effects of the storm. Your pet is in a state of panic. It’s brain is not in a state where it can learn. Punishing your pet for it’s undesirable behaviour will not discourage it for next time, it will only add to the anxiety your pet is experiencing. Likewise, reassuring your pet during a storm will NOT reinforce/ reward the panicky behaviour. Provide calm reassurance and do what is needed to keep your pet as calm as it can be. Let it hide, cuddle it, feed it, leave it alone, whatever it is indicating it wants as long as it is safe to do so. Dampen the noise of the storm: background music/white noise, even ear covers/ cotton wool in ears can help. Create a safe haven. Ideally let your dog choose the place it prefers to go during a storm (if safe). Consider creating a sound proof ‘den’ e.g. a cage with sound muting cover or a wardrobe lined with foam if your dog likes hiding there. Don’t lock your dog in the area as this can increase panic- let them come and go from the space as they wish. Minimise the effects of lightning: Leave the lights on & close the curtains. Your vet will discuss the problem with you, check there are no other underlying medical causes and give you tips for approaching, managing and treating the behaviour. They can prescribe medications to reduce your dog’s anxiety and put you in touch with helpful resources and other professionals who are experienced/ specialised in the area. Medication is often an important part of treatment as an anxious animal finds it difficult to learn so minimising anxiety will assist in the success of behaviour modification therapies. Your vet will prescribe anti-anxiety medications if deemed necessary. Please be aware that it may be necessary to try different anti-anxiety medications and/or doses to find what best works for your pet and their situation. Desensitisation- Storm CD’s are played at low enough levels that the dog is not showing fear response. Over time the noise is very slowly increased until the dog becomes used to it. As storms often have multiple fearful stimuli that can’t be reproduced by a CD (e.g. pressure changes, wind) desensitisation is often not successful on it’s own. Counter-conditioning- storm noise CD is played at very low level in the background while you play with your dog or give treats. Very slowly, over time the noise is gradually increased (being careful never to induce a fearful response) while you continue the positive experiences. The idea is that over time the dog associates thunder with positive experiences instead of fear. Relaxation training. This involves training your dog to relax. At times where there are no scary sounds practice training your dog to settle/ relax on their bed. This is done by giving the dog a yummy treat after it shows calm responses to cues such as ‘settle’ or ‘lie down’. Only once the dog can consistently settle to the cue do you start to introduce the relaxation training when the feared stimulus is present.